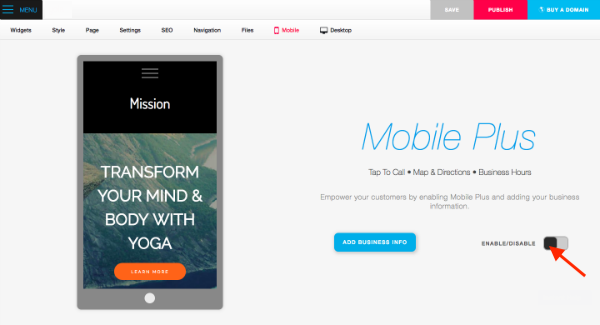 Mobile Publishing is designed to help your customers find you from anywhere and at any time. The mobile publishing functionality allows you to optimize your Yola site and publish it specifically for viewing on mobile devices. 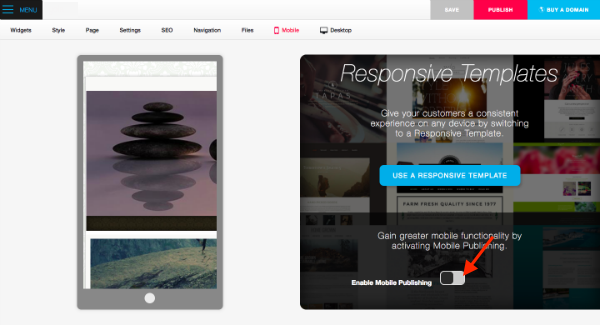 If your site is using one of our Responsive templates, it is already mobile-friendly! To view what your site looks like on a mobile device, click the Mobile preview button located along the top of the screen. The Mobile Plus option is available for any of our Responsive templates. and is exclusively available to Yola Silver and Yola Gold users. This adds a usability boost for users on the go, by displaying your business phone number, operating hours as well as the physical address. To enable this feature, slide the toggle button to the right. If you don't wish to have your business information displayed, you can toggle the button back over to the left. Although we encourage you to use a Responsive template, you have the option of using our Legacy Mobile publishing option if you choose to use a non-responsive template. This type of mobile publishing is only available to Yola Silver and Yola Gold users. To use this option, toggle the button to the right. You can change your header's background color and font to make it different from your non-mobile optimized site. 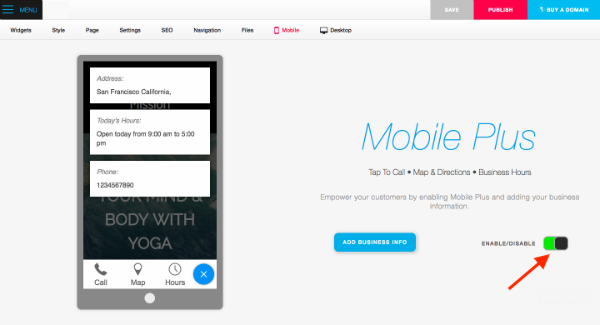 You can add a button for customers to call you instantly, without having to scroll through your site. You can add a Map button to display a map to your business, making it easier for customers to find you. You can choose whether to display your site's banner image on your mobile-optimized site. 1. 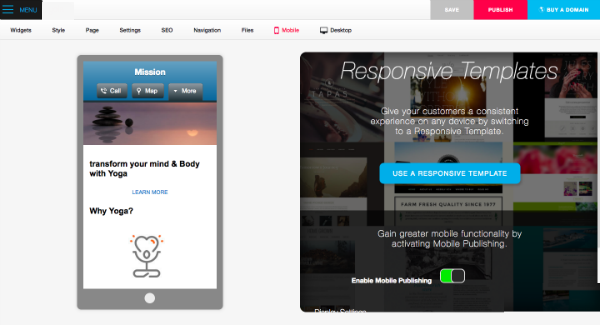 Publish your site with the responsive enhancements. 2. Go to the Mobile-Friendly Test page. You'll see the message "Awesome! This page is mobile-friendly." Please note: If you are using a non-Responsive style and do not use the Legacy mobile publishing option, your site will not pass Google's Mobile-Friendly test.